I’m flying solo this week. My husband is out of town so it’s dinner for one instead of two (while watching the entire season 2 of Downton Abbey!) I’m use to cooking for myself. That is actually how I discovered my passion for cooking. It is less intimidating to try a new recipe when the only person tasting the food is yourself. If I completely messed up the recipe (which rarely happened by the way), I could always eat a bowl of cereal. I wasn’t sure about which recipe to share with you this week, but after coming home for lunch on Monday, I found my idea. I’m one of the lucky people that can actually come home from work during my lunch break. I work about 8 minutes away from where I live (that’s if all the lights are green of course, and yes, I’ve timed it!) so whenever I feel like it, I just come home to “reenergize.” I either eat leftovers, or fix myself a sandwich (which is what I did this week). But it’s not any kind of sandwich! 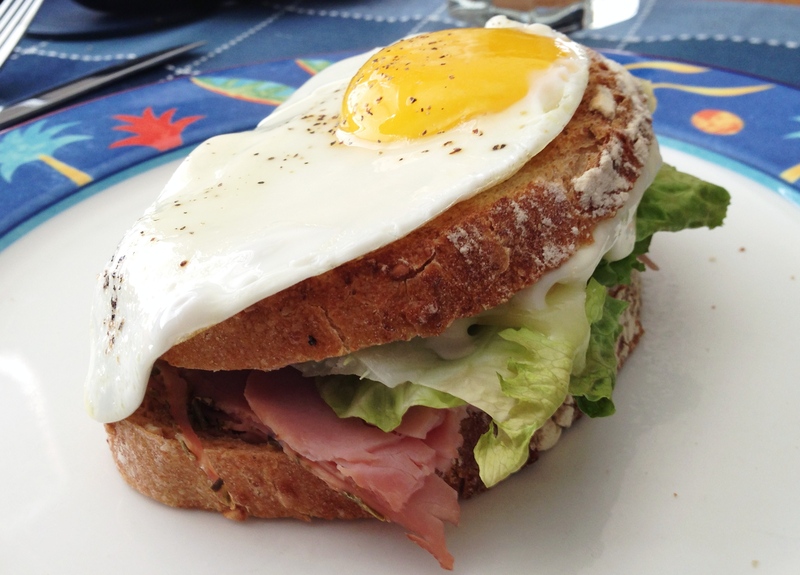 It might seem fancy to some, but to me it’s just the way my parents use to make sandwiches. I decided to share this little wonder with you, since it is so easy to make, and absolutely delicious. Put Dijon mustard on one slice of bread. Add one slice of cheese, slices of ham, the lettuce leaf chopped and the cornichons. Put mayonnaise on the second slice of bread, add slice of cheese and add the sandwich. Put sandwich in Panini press until cheese starts to melt. Meanwhile, cook egg sunny side up. Add salt and pepper. 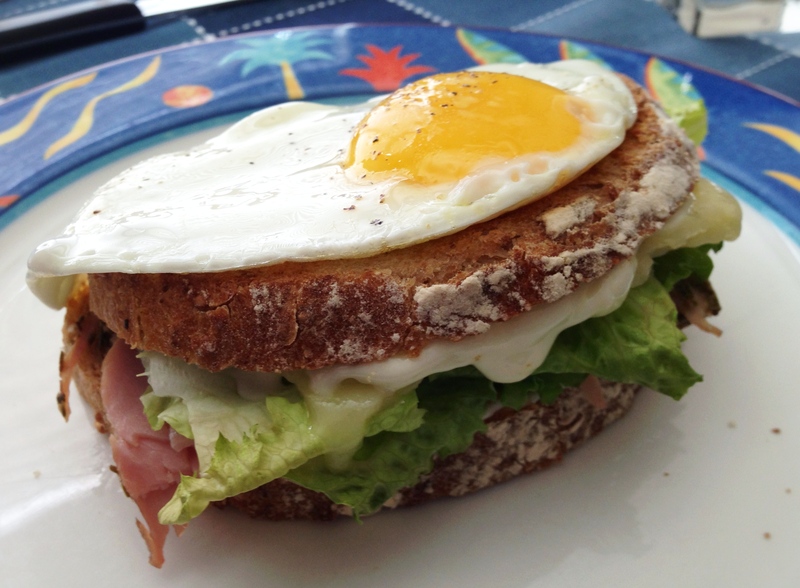 Once sandwich is ready, add egg on top. Enjoy. Looks delicious and easy to do! Thanks too for visiting my blog. 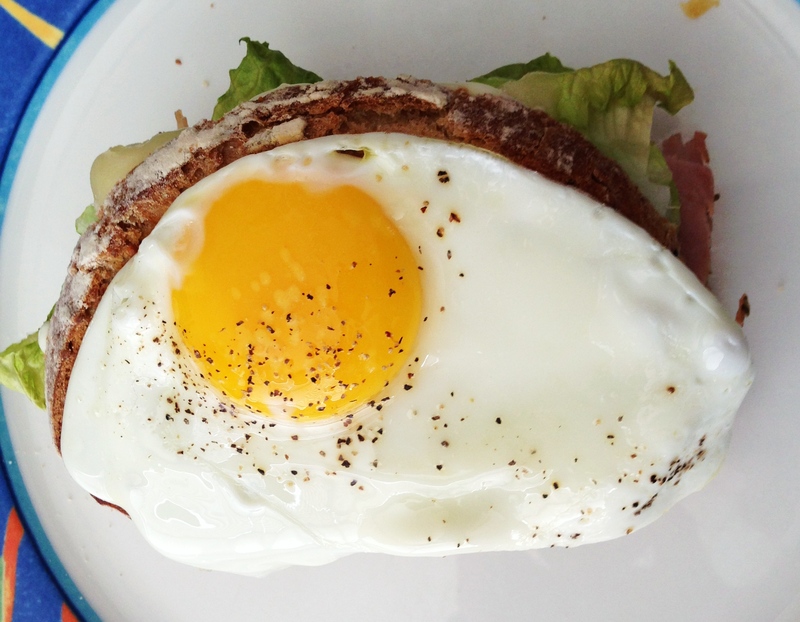 I love an egg on sandwiches! YUM!!!! MY tummy is growling just looking at this! Avec une fourchette et un couteau! Haha. Tu coupes au milieu (sur le jaune), et comme ça, tu « éponges » le jaune d’œuf avec chaque bouchée. Un délice. You just made me want a second lunch. 🙂 Bon Appetit! Haha thanks. It is very interesting to read your blog and see how the “French/American” culture works in your home. This is the most “me” sandwich I have ever seen. Is there anything that cannot be improved by a runny egg yolk on top? I totally agree! Glad you like it.